After much buying, selling, and trial and error, I've got a collection of good, mostly reasonably priced, prime lenses. I thought I'd post them here, as interestingly, a lot of them are Pentax. Four of them are M42 fitting. Personally I don't see the need to pay huge amounts for modern lenses, when so many old lenses are so good, especially around 50mm (I have five 50mm lenses that are all very good, though I generally use the A series 50mm f1.4, which is the best of them). I'd say anyone would be hard pressed to tell the difference in an image shot on my Minolta 55mm f1.8 and one shot on a Zeiss Sonar T*55mm f1.8. Plus, I love using old lenses, manual focus is very easy on the A7rii, and the rendering of some of these older lenses is more important than razor sharpness imo. I probably shoot more than 80% of my images nowadays with legacy lenses, though still mainly use AF lenses on the aircraft, though not at night. Phillip Reeve does excellent reviews on lenses old and new, and it's his reviews that led me to a couple of these. The downside is, he's made legacy lenses very popular, and some of the prices have gone through the roof recently. Sorry about the crap picture, I just took a quick snap of them while sorting them out and deciding which lenses to keep. These are the ones I am keeping. 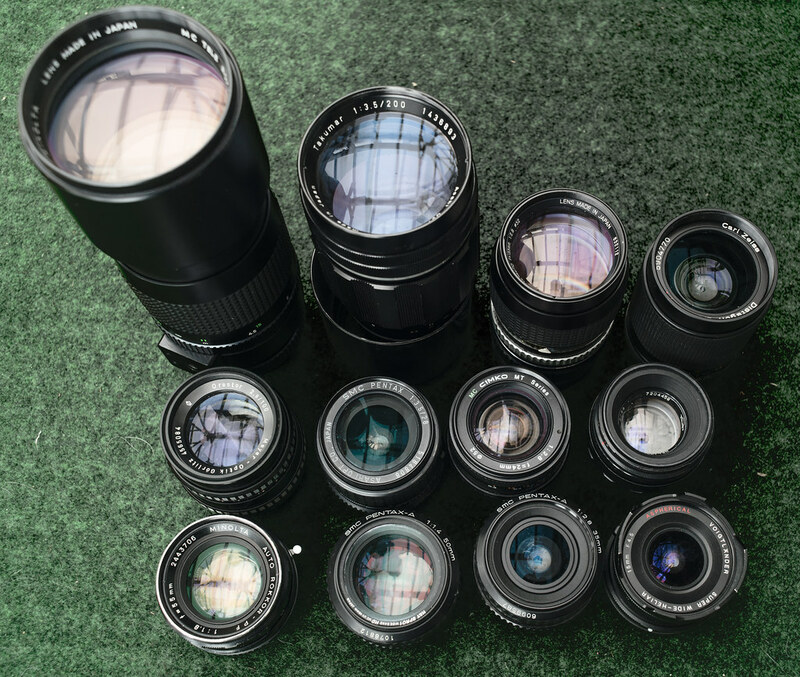 I'm currently sorting out a lot of other lenses, mainly Minolta, though a few Pentax, to put on ebay. I generally don't do lots of testing of lenses, I just try them and see how the images turn out, so these are just my overall thoughts on the lenses mentioned. Minolta MC Tele-Rokkor 300mm f4.5; Pretty sharp, but I hardly ever use it, as I rarely shoot beyond 100mm, and usually use my Sony 70-200mm instead. Takumar 200mm f3.5 preset; Great lens, and very sharp, especially considering it's age and construction (it's only got 4 elements), fantastic bokeh due to 18 aperture blades. Some purple fringing. Hoya HMC Tele-Auto 135mm f2.8; One of three 135mm lenses I currently own, including the Pentax M 135mm f3.5 and Minolta MD 135mm f2.8-surprisingy, the Hoya turned out to be the best of the three, by a reasonable margin, though I've not used it much as yet. M42 mount. Zeiss Distagon T* 28mm f2.0; This is the same lens as the Pentax K 28mm f2.0, which is what I was originally looking for. This was the most expensive legacy lens I have bought, but it is a stunning lens, razor sharp, and has excellent close-focus capabilities too. Pentax K 28mm f3.5; superb landscape lens, very sharp stopped down to f5.6, still very good wide open. Unfortunately, like quite a few lenses, Phillip Reeve raving about it has pushed the prices way up recently. MC Cimko 24mm f2.8; a stopgap until I find a really good 24mm. Saying that, on FF it outperforms the Sigma Super-Wide II 24mm f2.8, which I still have. The Sigma is great on a crop sensor, but corners are very soft on FF. Minolta Auto-Rokkor 55mm f1.8; this lens is mind bogglingly good. I paid 30 quid for it; the f1.7 versions go for silly money (Phillip Reeve again), but this older version seems to have slipped below the radar. It is incredibly sharp across the frame stopped down to f2.8, and more than acceptably sharp wide open. Probably the best bargain of recent years. Another lens that is great with extension tubes. Pentax SMC-A 50mm f1.4; another bargain, I picked this up many years ago from a camera shop in Bolton that was closing down, for 30 quid. It's a great lens, super sharp at f2, and works really well on the A7rii. Pentax SMC-A 35mm f2.8; another excellent lens. I also have the Minolta MD 35mm f2.8, itself a very well thought of lens, but the Pentax is sharper. Voghtlander Super-Heliar II 15mm f4.5; this lens generally gets panned by A7rii owners, as you sometimes get smearing in the corners, due to the lens being so close to the sensor (it's a rangefinder lens) However, I've had some good results from it, though it needs stopping down to f8, or even better f11, to stay sharp across the frame. It will do until I get an Irix 15mm. I have the Ks, 20/f4, 28/f3.5, 30/f3.5 and the 55/f1.8. I love them all, though the K-1 has found the 20 out somewhat, as it's the least sharp of the 4. Have yet to try the others, though I am led to believe they are very good. starless wrote: I have the Ks, 20/f4, 28/f3.5, 30/f3.5 and the 55/f1.8. I was looking for a K55/1.8, but not anymore, as I don't see how it could be better than my Minolta 55/1.8. I'm keen on finding a 30/3.5 though, and the K28/3.5 is superb. I tend to use that for landscapes and the Zeiss 28mm for close-ups, bikes, and with tubes. Have to say it's my favourite of the 30 or so lenses I have acquired in the last year or so. I've had a similar discussion on the other forum. The reason I also have the modern AF lenses is that I take gig photographs in low light, and it's impossible to manually focus these old manual lenses in the time necessary, simple as that. Also, you need a zoom! Couldn't agree more with the sentiment regarding so-called legacy primes. Much of my photography involves these. I do have a SMC 55mm f/1.8 which came free with my KX and despite having been knocked about a bit is a great lens for walking around with. Of the others that I use the most, the SMC 28mm f/3.5, SMC 35mm f/3.5, SMC 85mm f/1.8 and M 100mm f/2.8 make me smile every time, even when I get the shot wrong: they are a joy to use. Both great lenses, but a somewhat. Both perform very well on full frame. In fact the 30/2.8 performs better than on a crop sensor. The K28 is excellent. The K30 though is special.